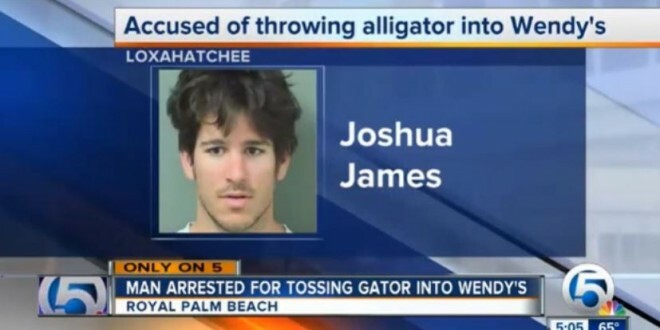 FLORIDA: Man Arrested For Assault After Throwing Live Alligator Through Wendy's Drive-Through Window - Joe.My.God. Gator wasn’t on the menu but one did make an appearance inside a Wendy’s just east of Loxahatchee in Royal Palm Beach. And it wasn’t by choice. A Jupiter man threw it through the restaurant’s drive-thru window, according to a Florida Fish and Wildlife Conservation Commission incident report. The incident report showed a picture of the gator inside the restaurant. James faces charges of aggravated assault and unlawful possession and transportation of an alligator. FWC said James admitted to picking up the gator on the side of Southern Boulevard and bringing it to the fast food restaurant. Next BREAKING: Ali Forney Center Reaches $200,000 Goal In Donation Campaign To Buy Harlem’s Hate Church!